Breaking bad habits seems like it’s just a matter of willpower—you’ve just got to force yourself to do it, day after day. But that’s not actually the case. Your success—or failure—in regards to establishing new behaviors (or changing unwanted ones) has to do with how habits are formed. If you’ve ever tried to quit drinking soda, cut bad eating habits or stop browsing social media, you’ve probably found that it’s difficult to keep this up for long periods of time. And the reason why may have more to do with the chemicals in your brain than willpower alone. So why are bad habits so hard to break? And what can you do to get back on track? It might surprise you to learn that the biggest obstacle to overcoming bad habits is the release of a chemical in the brain called dopamine. Habits are usually formed because we associate certain behaviors with past rewards. When you see or experience something that brought pleasure in the past—even if you aren’t consciously aware of it—dopamine is released into the brain. This release of dopamine increases feelings of happiness and creates an association between the habit and the reward. This reaction lasts a long time, even after you stop being rewarded for the action. A study by Johns Hopkins University tested this relationship. On the first day, participants were asked to locate red and green items on a screen, and they were paid for each one they found. On the second day, participants were asked to look for certain shapes. Red objects were scattered throughout the screen. The researchers monitored the brain waves of participants during the second trial. The results showed that dopamine was released when participants saw the red objects, even though there was no longer a reward for locating them. A similar study done by MIT suggests that certain neurons in the brain might also be responsible for helping habits form. Researchers tested the role of neurons in habit-forming by having rats run a maze. Initially, neurons in the rats’ brains would fire during the entire course. However, once the maze was learned, those same neurons would only fire twice: at the beginning, and at the end (when they received their reward). When you form a habit—good or bad—it’s because, at one point, you received a reward for it. And even when that reward is no longer present, your brain still reacts as though it were. Since bad habits are so closely related to pleasure, it can be a difficult task breaking them. Making things more difficult, it can be demoralizing when you slip and fall short. According to popular media, you can form new habits within 21 days. And many self-help books will tell you they can help you live better or knock bad habits in just a few short days or weeks. Science says differently. Habits take an average of 66 days to form, according to a 2009 study out of University College London, and can take even longer depending on the individual. And that’s just to create new habits! Breaking old ones is actually much harder, since you’re trying to destroy an already-established connection. Is it any wonder so many New Year’s resolutions fall through in the first two months? Thankfully, understanding how long it takes to form a new habit also provides us with an answer for how to break bad habits. Since it’s so much easier to form a habit than to break one, the key is to find a healthier habit to replace the old one. 1. Identify what causes the habit. Say you want to stop biting your nails. What triggers that behavior? In this case, perhaps it’s whenever you enter a stressful situation. 2. Identify the reward you get for performing that habit. In the nail-biting example, the reward may be that it helps relieve anxiety. 3. Figure out a substitute. The substitute should be used whenever you enter a situation where the habit’s triggered, and should give the same sort of reward. To replace your nail-biting habit, you could carry around a small sketchpad. When you start to feel anxious, doodle to help relieve your stress. 4. Rinse and repeat. Your first attempt to change a habit might not go according to plan. That’s okay. Experiment with other options to see what ends up working best for you. When replacing one habit with another, make sure your new habit is healthy. A lot of smokers will try to replace smoking with eating, for example, which can still cause health problems, albeit different ones. Remember that patterns of behavior aren’t going to change overnight. It can take several months to form new habits, and it may take a while to really replace a bad habit. Celebrate the little victories! And if something isn’t working, it may be that it doesn’t suit your personality or lifestyle. Don’t be afraid to try a bunch of different things, and give yourself time to see if they work. Bad habits are associated with a reward, and can be extremely hard to break. When you fail to break a habit, you may beat yourself up, cursing our lack of willpower. As we noted, however, willpower is rarely the deciding factor. All you really need to do to change a habit is trick your brain a little. By switching in a healthier habit with the same reward, you can have a much easier time getting rid of bad habits for good. Chronic inflammation is a major contributing factor in the pathogenesis of many diseases. Natural product berberine (BBR) exhibits potent anti-inflammatory effect in vitro and in vivo, while the underlying mechanisms remain elusive. Sirt1, a NAD+-dependent protein deacetylase, was recently found to play an important role in modulating the development and progression of inflammation. Thus, we speculate that Sirt1 might mediate the inhibitory effect of BBR on inflammation. In LPS-stimulated RAW264.7 macrophages, BBR treatment sig- nificantly downregulated the expression of proinflammatory cytokines such as MCP-1, IL-6 and TNF-α. Importantly, BBR potently reversed LPS-induced down-regulation of Sirt1. Consistently, the inhibitory effects of BBR on proinflammatory cytokines expression was largely abrogated by Sirt1 inhibition either by EX527, a Sirt1 inhibitor or Sirt1 siRNA. Further mechanistic studies revealed that BBR-induced inhibition of NF-κB is Sirt1- dependent, as either pharmacologically or genetically inactivating Sirt1 enhanced the IκΒα degradation, IKK phosphorylation, NF-κB p65 acetylation and DNA-binding activity. Taken together, our results provide the first evidence that BBR potently suppressed inflammatory responses in macrophages through inhibition of NF-κB signaling via Sirt1-dependent mechanisms. Berberine (BBR), a major form of isoquinoline alkaloid isolated from plants such as Cotex phellodendri, Hydrastis canadensis and Rhizoma coptidis, has been used in Chinese medicine more than hundreds of years, showing multiple pharmacological activities . Several reports showed that BBR possesses anti-inflammatory activities in vitro and in vivo . In cultured RAW264.7 and primary peritoneal mac- rophages, BBR potently inhibited LPS-induced expression of proin- flammatory genes including IL-6, iNOS, and COX-2, mediated via AMPK activation . Another study showed that BBR has anti-inflammatory effects on 3 T3-L1 adipocytes, evidenced by the down-regulation of mRNA level of several inflammation markers . In either db/db or diet-induced obese mice, BBR reduced serum levels of TNF-α and IL-6 and inhibited the activation of NF-κB pathway in the adipose tissue [14,15]. In acute coronary syndrome patients, treatment for 30 days with BBR resulted in a significant reduction of serum IL-6, MCP-1 and C-reactive protein . Meanwhile, our recent study reported that BBR inhibited M1 macrophages polarization and activation in adipose tissue in high fat diet-induced obese mice . Nevertheless, the exact me- chanisms underlying the anti-inflammatory properties of BBR is not fully understood, especially in macrophages. In the present study, we investigated the anti-inflammatory effects of BBR on macrophages in vitro and its association with Sirt1, given increasing evidence that Sirt1 functions as a crucial regulator of in- flammatory processes. Our results showed that BBR decreased the ex- pression of proinflammatory cytokines and inhibited the activation of NF-κB pathway in a Sirt1-dependent manner. These discoveries may help to further unveil the mechanisms of BBR’s anti-inflammatory ac- tion. Berberine(≥98% purity), DMSO, and LPS (Escherichia coli, serotype 0111:B4) were obtained from Sigma-Aldrich (St. Louis, MO, USA). Lipofectamine RNAiMAX reagent and Trizol reagent were purchased from Invitrogen (Carlsbad, CA, USA). PrimerScript RT reagent Kit and SYBR Green PCR kit were purchased from Takara (Dalian, China). The antibodies against IκΒα, NF-κB p65 and acetyl-NF-κB p65 (Lys310) were purchased from Abcam (Cambridge, MA, USA). Monoclonal an- tibodies to Sirt1, IKKβ, phospho-IKKβ, and horseradish peroxidase conjugated anti-rabbit and anti-mouse antibodies were purchased from Cell Signaling Technology (Beverly, MA, USA). β-actin mouse mono- clonal antibody was purchased from Santa Cruz Biotechnology (Santa Cruz, CA, USA). BCA protein assay kit and West Pico chemiluminescent substrate were purchased from PIERCE (Rockford, IL, USA). Unless otherwise specified, all other reagents were analytic grade. Murine RAW264.7 macrophages were obtained from Cell Bank of the Chinese Academy of Sciences (Shanghai, China). Cells were cul- tured in high glucose DMEM (GIBCO, Invitrogen Life Technologies Corporation, NY, USA) supplemented with 10% newborn calf serum (GIBCO, Invitrogen Life Technologies Corporation, Auckland, New Zealand), 100 U/ml penicillin and 100 μg/ml streptomycin in a humi- dified atmosphere with 5% CO2 at 37 °C. In all experiments, cells were acclimated for 24 h and then pretreated with berberine, berberine + EX527 at different concentrations 4 h prior to LPS (100 ng/ml) sti- mulation. crystals. Then, the absorption values were measured at 570 nm on a microplate reader. The optical density in the control group cells (no BBR and LPS treatment) was considered 100% viability. The small interfering RNA (siRNA) duplexes for Sirt1 were com- mercially synthesized by Genepharma (Shanghai, China). The sequence was 5′-CCGUCUCUGUGUCACAAAUTT-3′. On the day before transfec- tion, RAW264.7 cells were seeded into six-well plates and grown in 2.0 ml of DMEM supplemented with 10% FBS. Then, Sirt1 siRNA or scrambled siRNA were transfected into RAW264.7 cells with Lipofectamine RNAiMAX reagent according to the manufacturer’s in- structions. After 72 h growth, RAW264.7 cells were used for the further interventions. Meanwhile, the knockdown in Sirt1 expression was evaluated by Western blot analysis. The mRNA expression of MCP-1, IL-6 and TNF-α were measured by qPCR, and β-actin was used as an internal control for mRNAs. Total RNA was isolated from RAW264.7 cells with Trizol reagent according to the manufacturer’s instructions and reverse transcribed into cDNA using the PrimerScript RT reagent Kit. PCR amplification was performed with a SYBR Green PCR kit using the Applied Biosystems 7500 Real-Time PCR System in triplicates for three times independently. The following primer sequences were used: MCP-1 forward 5′-ACC GGGA GGTG GTGA GGGT C-3′, MCP-1 reverse 5′-TGA GCCT ACGG GATC TGAA AGAC G-3′, IL-6 forward 5′-TGT GCAA TGGC AATT CTGA T-3′, IL-6 reverse 5′-CT CTGA AGGA CTCT GGC TTTG-3′, TNF-α forward 5′- CAACGCC CTCC TGGC CAA CG-3′, TNF-α reverse 5′-TCG GGGC AGCC TTG TCCC TT-3′, β-actin forward 5′-CGTTGAC ATCC GTAA AGAC C-3′ and β-actin reverse 5′-AAC AGTC CGCCTAGA AGCA C-3′. Parameters of PCR were: 5min 95°C for one cycle, 15s 95°C, 1min 60°C for 40 cycles, and 5 min 72 °C for one cycle. Reaction specificity was con- trolled by post-amplification melting curve analyses and gel electro- phoresis of products. The expression fold-changes were analyzed by the 2 − ΔΔCt relative quantitative method. RAW264.7 macrophages were seeded at a density of 1.0 × 106 cells/ml in 6-well plates, followed by incubation with serum- free DMEM containing BBR, BBR + EX527 with or without LPS (100 ng/ml) for 16 h. The levels of MCP-1, IL-6 and TNF-a in the culture supernatant were quantified using commercially available mouse ELISA kits from eBioscience (San Diego, CA, USA), according to the manu- facturer’s instructions. All experiments were performed in triplicate. For Western blot analysis, RAW264.7 cells were harvested and suspended in ice-cold lysis buffer (50 mM Tris, 50 mM KCl, 20 mM NaF, 1 mM Na3VO4, 10 mM EDTA, 1% NP-40, 1 mM PMSF, and 5 μg/ml leupeptin, pH 8.8). Lysates were sonicated on ice and incubated for 30 min before being centrifuged at 12,000 rpm for 30 min at 4 °C.·Protein concentration was determined using the BCA protein assay kit. Equal amounts of protein were separated by 12% SDS-PAGE and transferred to PVDF membranes (Millipore, Bedford, MA, USA). Membranes were incubated with blocking buffer (5% w/v BSA in TBS containing 0.1% Tween-20) for 2 h at room temperature, and incubated with a primary antibody overnight at 4 °C. After washing with TBS containing 0.1% Tween-20, the membranes were incubated for 2 h at room temperature with HRP-linked secondary antibodies. The mem- branes were then detected by the ECL plus Western blotting detection system (GE healthcare, Piscataway, NJ, USA) and quantified by the Quantity ONE software (Bio-Rad, Hercules, CA, USA). β-actin was used as an internal control. According to the manufacturer’s instructions, NF-kB p65 Transcription Factor Assay Kit was performed (Abcam, Cambridge, MA, USA) to detect NF-κB p65 DNA-binding activity. The absorbance at 450 nm was determined using a microplate reader. Statistical analyses were performed using GraphPad PRISM 4.0. All values were expressed as mean ± standard errors of the means (SEMs). All data were from at least three independent experiments. Differences among multiple groups were determined by one-way ana- lysis of variance (ANOVA) followed by Tukey’s post-hoc test. Values were considered significantly different at P < 0.05. In our study, we first examined the potential cytotoxicity of BBR by the MTT assay after incubating cells for 20 h in the absence or presence of LPS (100 g/ml). The results showed that BBR at the concentration up to 5 μM had no cellular toxicity on RAW264.7 cells. However, higher concentration of BBR showed obvious cytotoxicity (Fig. 1A). Thus, BBR concentrations ranging from 1 to 5 μM were selected for the subsequent experiments. treatment for 16 h obviously up-regulated the levels of MCP-1, IL-6 and TNF-α. As expected, pretreatment with BBR also clearly inhibited the release of these cytokines in a dose-dependent manner (Fig. 2). Therefore, these findings showed that BBR significantly inhibited the LPS-induced expression of proinflammatory cytokines. There is accumulating evidence that Sirt1 exerts anti-inflammatory effects in various cells and its pharmacological activation may con- stitute a potential therapeutic strategy . Thus, we sought to in- vestigate whether Sirt1 participated in LPS-induced inflammation re- sponses. RAW264.7 cells were exposed to LPS for 20 h and harvested. Total protein sample of cells was detected by Western blot analysis. As shown in Fig. 3A and B, treatment with LPS produced marked decreases in Sirt1 protein levels. Interestingly, BBR (1, 2.5, 5 μM) pretreatment significantly reversed the LPS-induced down-regulation of Sirt1 in a dose-dependent manner. Based on these data, we postulate that the suppressive effects of BBR on LPS-induced inflammation involve Sirt1 up-regulation in RAW264.7 cells. To test the hypothesis, pharmacologically and genetically blocking experiments were conducted. First, RAW264.7 cells were pretreated with the specific Sirt1 antagonist Ex527 (10 μM) and or BBR (5 μM) for 4 h, and subsequently received LPS treatment for 6 h or 16 h. Consistent with the results shown in Fig.1and 2, BBR obviously down-regulated both the mRNA and protein levels of MCP-1, IL-6 and TNF-α. Fig. 1. Berberine (BBR) suppressed proinflammatory genes expression in LPS-stimulated RAW264.7 macrophages. (A): Effect of BBR on the viability of RAW264.7 cell. The cells were pretreated with BBR (1–20 μM) for 4 h, then stimu- lated with or without 100 ng/ml LPS for 20 h. Cell viability was determined via MTT assay and relative cell viability was calculated by compared with untreated control group. (B–D): Effect of BBR on the expression of proinflammatory genes. The cells were pretreated with BBR (1–5 μM) for 4 h before incubation with 100 ng/ml LPS for 6 h. Relative mRNA levels of each gene was analyzed with qRT-PCR and normalized to β-actin. Quantitative data were presented as mean ± SEM (n = 3). #p < 0.05 versus control, ##p < 0.01 versus control, ⁎p < 0.05, ⁎⁎p < 0.01 versus LPS alone. Fig. 2. BBR prevented the LPS-stimulated release of MCP-1, IL-6 and TNF-α in RAW264.7 macrophages. The cells were pretreated with BBR (1–5 μM) for 4 h before incubation with 100 ng/ml LPS for 16 h. Then, secretion of MCP-1 (A), IL-6 (B) and TNF-α(C) in the media was evaluated by ELISA assay. Quantitative data were presented as mean ± SEM (n = 3). ##p < 0.01 versus control, ⁎p < 0.05 versus LPS, ⁎⁎p < 0.01 versus LPS. Fig. 3. Effects of BBR on Sirt1 protein in LPS-stimulated RAW264.7 macrophages. (A-B): The cells were pretreated with BBR (1–5 μM) for 4 h before incubation with 100 ng/ ml LPS for 20 h. Then, cell lysates were prepared and analyzed for Sirt1 by Western blot analysis. β-actin was used as an internal control. (C–D): The cells were trans- fected with Sirt1 siRNA or control siRNA. Seventy-two hours after transfection, the expression of Sirt1 was mea- sured by Western blot analysis. β-actin was used as an in- ternal control. Quantitative data were presented as mean ± SEM (n = 3). ##p < 0.01 versus control. analysis. As shown in Fig. 5E and F, LPS treatment significantly strengthened acetylation of p65. However, the acetylation levels were attenuated to some degree by BBR treatment. Moreover, the NF-κB p65 DNA binding activity was measured in current study as well. As shown in Fig. 5G, LPS-enhanced the NF-κB p65 DNA binding activity were markedly blunted by BBR pretreatment. The results indicated that BBR broadly inhibited LPS-induced NF-κB pathway activation in RAW264.7 cells. Sirt1/NF-κB axis is known to be involved in regulating expression of inflammatory cytokines . To further elucidate the mechanism un- derlying the anti-inflammatory effects of BBR, we conducted a set of blocking experiments. The activation of NF-κB pathway was measured after blocking Sirt1. As shown in Fig. 6A–E, when Sirt1 was inhibited by EX527 or targeted siRNA, the suppressive effects of BBR on IκΒα de- gradation, IKK phosphorylation and NF-κB p65 acetylation were clearly reduced in LPS-simulated RAW264.7 cells. Blockage of Sirt1 also sig- nificantly attenuated the inhibitory effect of BBR on LPS-enhanced the NF-κB p65 DNA binding activity (Fig. 6G). These results from blocking experiments would hence, demonstrate that BBR-induced inhibition of NF-κB pathway was, at least in part, through activating Sirt1 in our system. Inflammation, as normal response of organisms to various injuries, plays a crucial role in host defense. However, uncontrolled and self- amplified inflammation is a major contributing factor in the patho- genesis of many diseases. Macrophages play a hub role in the initiation and modulation of host defense including inflammation, and can be activated by multiple proinflammatory stimuli such as LPS and TNF-α to trigger a cascade of inflammatory processes . BBR is a major form of isoquinoline alkaloid isolated from plants such as Rhizoma coptidis, with promising anti-inflammatory effects . the best of our knowledge, this is the first report demonstrating the anti- inflammatory effects of BBR and its association with Sirt1 in macro- phages. It is well established that proinflammatory cytokines such as MCP-1, IL-6, IL-1β, COX2, and TNF-α play important roles in the pathogenesis of many diseases . Some studies also showed that the expression of above cytokines were associated with the severity of inflammation and activation of macrophages both in vivo and in vitro . Hence, blockage of these proinflammatory cytokines is becoming a promising strategy to alleviate and even cure some diseases. We previously de- monstrated that BBR administration improved insulin resistance and reduced serum levels of IL-6 and TNF-α in diet-induced obese mice . Another study found that 5 μM BBR significantly reduced LPS- induced proinflammatory genes expression including IL-6, IL-1β, iNOS, MCP-1 and COX-2, suppressed the phosphorylation of MAPKs, and decreased the level of reactive oxygen species in macrophages . In this study, the levels of MCP-1, IL-6, and TNF-α were used to indicate the severity of inflammation in LPS-stimulated RAW264.7 cells. As shown in Fig. 1, BBR pretreatment dose-dependently suppressed MCP- 1, IL-6 and TNF-α mRNA expression, compared to the LPS-treated group. Our present data confirmed that BBR is an anti-inflammatory substance. In addition, the effect of BBR on secretion of MCP-1, IL-6 and TNF-α was determined via ELISA assay. As expected, pretreatment with BBR also effectively inhibited the release of these cytokines in a dose- dependent manner. These results suggested that BBR exhibited in- hibitory effects on the production of these proinflammatory cytokines at both gene transcription and translation levels. Sirt1 has been shown to be involved in the regulation of numerous development and homeostatic processes, including inflammatory re- sponse . It cleaves the nicotinamide ribosyl bond of NAD+ and transfers the acetyl group from proteins to NAD+, thus leading to tighter chromosome structure and transcriptional repression of many inflammation-related genes . Furthermore, some studies reported that BBR can activate Sirt1 in vivo and in vitro. Lin and colleagues demonstrated that BBR treatment for two weeks could protect against ischemia/reperfusion injury after orthotopic liver transplantation via activating Sirt1 . Zhu et al. found that BBR exhibited a time-de- pendent effect on upregulation of Sirt1 in L02 cells, which could play an important role in its antioxidant activity under oxidative stress . However, it is unclear whether BBR is also able to activate Sirt1 in macrophages. Our data showed that BBR (1, 2.5, 5 μM) pretreatment significantly reversed the LPS-induced down-regulation of Sirt1 in a dose-dependent manner. This implies that the inhibitory effect of BBR on inflammation in macrophages may be mediated by Sirt1. Attrac- tively, after inhibition of SRT1 with special antagonist EX527, the re- pressive effects of BBR on LPS-induced MCP-1, IL-6 and TNF-α ex- pression was remarkably abrogated. Knockdown of Sirt1 by siRNA also significantly reduced the suppressive effects of BBR on LPS-induced expression of proinflammatory cytokines. elucidate the exact mechanism of how BBR is able to activate Sirt1 in macrophages. NF-κB pathway has a key function in the induction of major in- flammatory mediators. Under physiological conditions, NF-κB is held quiescent in the cytoplasm and binds to IκBα. When stimulated by LPS via Toll-like receptors, the IκBα is phosphorylated by IKK, which leads to ubiquitin-dependent proteasomal degradation and the subsequent translocation of NF-κB from cytoplasm to the nucleus . Excitation of NF-κB results in transcription of a cascade of proinflammatory cyto- kines and chemokines, such as TNF-α, IL-1β, COX-2 and so on . The expression of NF-κB-targeted genes is also modulated by acetylation of p65, a subunit of the heterodimetric proteins . Mutational analysis showed that acetylation of p65 at lysine 310 is required for full acti- vation of NF-κB function . Several studies found that the anti-in- flammatory property of BBR was resulted from the inactivation of NF- κB pathway [31,32]. And our previous study also discovered that BBR potently inhibited the activation of NF-κB pathway in adipose tissues of diet-induced obese mice . Here in our study, BBR treatment sig- nificantly inhibited LPS-induced IκΒα degradation, IKK phosphoryla- tion, decreased the p65 acetylation and DNA-binding activity. Never- theless, the signaling pathway of BBR in mediation of NF-κB was not very clear. Meanwhile, several studies showed that Sirt1 is able to ameliorate NF-κB-induced inflammatory responses through multiple mechanisms . Sirt1 can directly combine with and deacetylates the p65 subunit at lysine 310 and subsequently inhibits NF-κB transcriptional activity [6,33]. Then, we further tested whether the actions of BBR were mediated by Sirt1 through the inhibition of NF-κB. We showed that addition of EX527 or knocking down Sirt1 by targeted siRNA significantly alleviated the inhibitory effect of BBR on NF-κB pathway in LPS-stimulated RAW264.7 cells. The results support our speculation that BBR-induced NF-κB inhibition was largely dependent on Sirt1 activation in macrophages. Taken together, our results demonstrated that BBR potently sup- pressed inflammatory responses in macrophages through inhibition of NF-κB signaling via Sirt1-dependent mechanisms. These results may deepen our knowledge and understanding of BBR, and give some novel insight into its full application. However, further studies should be carried out to confirm this mechanism in vivo. Children who eat faster tend to eat more and gain weight. Supplementing with genistein, a soy isoflavone, may improve insulin sensitivity. Following a calorie-reduced diet for an extended period may reduce food cravings. 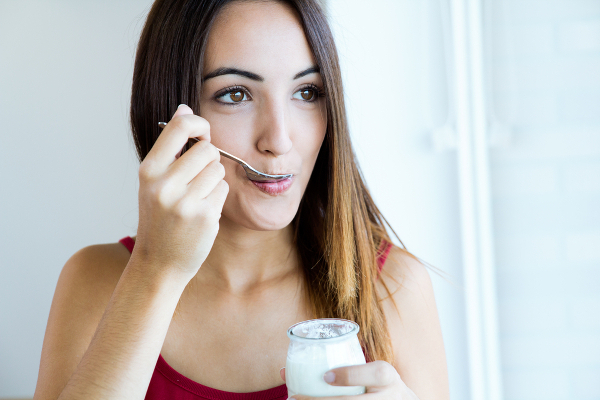 Eating probiotic yogurt may improve immune function, potentially reducing the risk of infection. Faster eating rates are associated with higher energy intakes during an ad libitum meal, higher BMI and greater adiposity among 4Â·5-year-old children: results from the Growing Up in Singapore Towards Healthy Outcomes (GUSTO) cohort. This observational study in Singaporean children showed that those who ate faster had a higher calorie intake and tended to have a higher body mass index and fat mass, compared to children who ate slower. Specifically, children who ate faster had a 75% higher calorie intake than those who ate slowly. Subcutaneous fat loss is greater than visceral fat loss with diet and exercise, weight-loss promoting drugs and bariatric surgery: a critical review and meta-analysis. This meta-analysis concluded that all weight loss methods, including dietary modifications, pills like garcinia cambogia, exercise, supplements or bariatric surgery, cause a greater loss of skin fat than belly fat when measured by volume or weight. However, the percent decrease in belly fat is always greater than the percent decrease in skin fat. is an antioxidant isoflavone found in high amounts in soybeans and soy products. This controlled study in 82 adults with non-alcoholic fatty liver disease (NAFLD) showed that taking 250 mg of genistein supplements daily for 2 months reduced insulin resistance and markers of oxidative stress and inflammation. Alcohol consumption and risk of heart failure: meta-analysis of 13 prospective studies. Heart failure occurs when the heart is not able to pump enough blood throughout the body to meet the bodyâ€™s needs. Previous studies have provided inconsistent results on the association between alcohol intake and heart failure. This analysis of 13 observational studies found that light alcohol intake was linked to a 14% lower risk of heart failure, whereas higher intake was not associated with it. (AS) is a disease of the arteries, which are the blood vessels that carry blood from the heart. Previous studies show that nitrate-rich vegetables improve the health of blood vessels, including the arteries, but it is unknown if they affect AS. This prospective observational study in 1,226 older Australian women showed that a high intake of nitrate-rich vegetables was associated with a lower risk of death from atherosclerosis. Inflammatory diet and risk of colorectal cancer: A population based Case-Control Study in Newfoundland, Canada. This observational study in Canadian adults found that following a pro-inflammatory diet, which ranked high on the DII, was linked to an increased risk of colorectal cancer. Extended calorie restriction suppresses overall and specific food cravings: a systematic review and a meta-analysis. This review and meta-analysis concluded that following a calorie-reduced diet for an extended period reduces food cravings. This observational study in 13,373 older Japanese people showed that those who ate citrus fruits 3â€“4 times per week were 8% less likely to develop dementia than those who ate citrus fruits two or less times per week. Effect of maternal antenatal and newborn supplementation with vitamin A on cognitive development of school-aged children in rural Bangladesh: a follow-up of a placebo-controlled, randomized trial. This controlled study in Bangladeshi mothers and their children showed that taking vitamin A supplements during pregnancy and around birth had no significant effects on the childrenâ€™s intelligence or memory at the age of eight. However, children who were exposed to vitamin A supplements as newborns and while still in the womb were significantly better at reading, spelling and math, compared to the placebo. (BE) is a complication of chronic acid reflux. It is characterized by changes in the cells that line the lowest part of the esophagus, which is the tube that carries food from the mouth to the stomach. This observational study suggests that drinking coffee or tea reduces the risk of BE and inflammation in the esophagus. Milk-cereal and whole-grain dietary patterns protect against low bone mineral density among male adolescents and young adults. This observational study in 1,351 Korean men aged 10â€“25 showed that a high intake of milk, cereals and whole grains was associated with a higher bone mineral density, possibly reducing their future risk of developing osteoporosis. Diet with a combination of high protein and high total antioxidant capacity is strongly associated with low prevalence of frailty among old Japanese women: a multicenter cross-sectional study. This observational study in 2,108 Japanese women aged 65 and older showed that a high intake of protein and/or antioxidants was associated with a lower risk of frailty. A combination of both seemed to provide the greatest protection against frailty. is a degenerative joint disease characterized by the breakdown of cartilage in joints. The main symptoms are joint swelling, stiffness and pain. This observational study in US adults showed that a higher fiber intake was associated with a lower risk of osteoarthritis. The association of dietary vitamin C intake with periodontitis among Korean adults: Results from KNHANES â…£. Periodontitis, or gum disease, is characterized by inflammation in the tissues that surround the teeth. It is caused by a strong immune reaction to the bacteria that live on the teeth. This observational study in 10,930 Korean adults found that inadequate vitamin C intake was linked to a higher risk of periodontitis. (CRP) is an inflammatory marker. Its levels increase in response to inflammation in the body. This observational study in 908 South Korean adults aged 40 or older found that a high intake of pantothenic acid (vitamin B5) was associated with lower levels of CRP. Cholecalciferol, also known as vitamin D3, is a form of vitamin D found in animal fat. This meta-analysis of controlled studies concluded that cholecalciferol supplements do not appear to affect the levels of the inflammatory markers C-reactive protein (CRP) and interleukin 6 (IL-6). This study in 200 adults examined the effects of eating probiotic yogurt every day for three months on immune function. The yogurt contained three probiotics: Lactobacillus paracasei, heat-treated L. plantarum and Bifidobacterium animalis. The study showed that the probiotic yogurt significantly improved immune function, including natural killer cell activity, compared to those who consumed plain milk. Higher adherence to the â€˜vegetable-richâ€™ dietary pattern is related to longer telomere length in women. Telomeres are sequences of DNA at the ends of DNA strands that protect them from fusing with neighboring strands. They naturally shorten with age, but oxidative stress may accelerate their shortening, possibly contributing to aging. This observational study in 553 Chinese adults found that a high intake of dairy products, eggs, tea, nuts, whole grains, fruits and vegetables was associated with longer telomeres in women, but not men. Caffeine consumption and telomere length in men and women of the National Health and Nutrition Examination Survey (NHANES). This observational study in 5,826 US adults found that a high caffeine intake was linked to reduced telomere length. Specifically, for every 100 mg of caffeine consumed per day, telomeres were 35.4 base pairs shorter. However, a high intake of coffee, which is rich in caffeine, was associated with longer telomeres. Vitamin D supplementation and growth in urban Mongol school children: Results from two randomized clinical trials. This controlled study in vitamin D-deficient school children from Mongolia showed that taking 800 IU of vitamin D3 (cholecalciferol) supplements daily for six months improved their growth. In contrast, a second study found that drinking milk enriched with 300 IU of vitamin D every day for seven weeks did not significantly affect growth. The PI3K/PTEN/AKT/mTORC1/GSK-3 pathway is a central signaling axis involved in many biological processes. This pathway plays pivotal roles in cell growth, inflammation, diabetes as well as neurological disorders such as Alzheimer’s disease (AD). GSK-3 is an important kinase involved in many biochemical properties including: neurological disorders, diabetes, cancer and signaling pathways such as WNT/beta-catenin and NOTCH as well as others. The biological and biochemical effects of GSK-3 have been recently reviewed (McCubrey JA. et al., 2014a; McCubrey et al., 2014b; McCubrey et al., 2014c; Chappell et al., 2016; McCubrey et al., 2106a; McCubrey 2016b; McCubrey et al., 2017a) GSK-3 often serves to negatively regulate certain molecules by phosphorylation. Phosphorylation of proteins by GSK-3 can result in their targeting to the proteasome and subsequent degradation. Since some of the target proteins of GSK-3 are often associated with apoptosis, cancer and development, GSK- 3 has been proposed to have tumor-suppressor effects. Although some studies have indicated that GSK-3 may have tumor promoter effects. GSK-3 is phosphorylated and activated by AKT phosphorylation. AKT is a central kinase that is activated by cytokines and other stimulatory signals. The PI3K/PTEN/AKT/mTORC1/GSK-3 pathway is often associated with proliferation and prevention of apoptosis. Thus, GSK-3 is fundamentally linked with PTEN, AKT, mTORC1 and other signaling and metabolic pathways. This review will focus on some of the effects of nutraceuticals on GSK-3 often in relation to the PI3K/PTEN/AKT/mTORC1 pathway. The effects of CUR on the OCT-4 transcription factor and GSK-3beta activation have been examined in NCCIT human embryonic carcinoma cells. CUR was determined to inhibit OCT-4 transcription and increase the total level of GSK-3beta which resulted in the induction of apoptosis (Yun et al., 2015). The abilities of CUR to inhibit GSK-3 have been investigated. By stimulated molecular docking experiments, CUR was determined to fit into the binding pocket of GSK-3. CUR inhibited GSK-3 activity with an IC50 of approximately 66.3 nM. CUR treatment of mice resulted in an increase of glycogen in the liver potentially because glycogen synthase (GS) is a target of GSK-3, and after CUR treatment GS was not phosphorylated by GSK3 and thus was active (Bustanji et al., 2019). A diagram of the effects of CUR on GSK-3 and various diseases is presented in Figure 1. Often various signaling pathways are aberrantly regulated in various neurological diseases including: AZ, Amyotrophic lateral sclerosis and others (Tomita et al., 2015; Bradshaw et al., 2015; Shamseddine et al., 2015; Tu-Sekine et al., 2015, Aditi et al., 2016; Rohacs T. 2016; Giudichi et al., 2016; Yang et al., 2016; Kang et al., 2016; Hayashi et al., 2016 Scarlata et al., 2016; Ghim et al., 2016) CUR has been linked with anti-amyloidogenic properties. Injection of the beta-amyloid (A-beta) peptide into rats resulted in learning developmental abilities. The animals had activated astrocytes and microglial cells. The activity of the AKT/GSK-3 pathways was altered as well as the expression of brain-derived neurotrophic factor (BDNF). CUR was determined to prevent some of the effects of A-beta injection. CUR-lipid core nanoparticles (CUR-LNC) were demonstrated to induce protective effects against the signaling disturbance induced by A-beta at 20-fold lower levels than administration of CUR by itself. Thus, CUR in LNC may represent an alternative means to treat AD patients which can have alterations in GSK- 3beta signaling (Hoppe et al., 2013). CUR has been shown to have protective effects against the mitochondrial dysfunction induced by A-beta in AD. CUR protected neuroblastoma SH-SY5Y cells against the harmful effects of energy metabolism. CUR prevents many of the A-beta effects on mitochondrial dysfunction as well as the levels of total and phosphorylated GSK-3beta. CUR was determined to suppress the expression of proteins associated with the apoptosis induced by mitochondrial dysfunction including, BAX, Caspase-3 and cytochrome C which can be activated by A-beta. Thus, CUR treatment could provide protection against A-beta-stimulated stimulated oxidative stress and mitochondrial metabolic deficiency. GSK-3beta maybe a target of CUR in these events (Huang et al., 2012). Presenilin-1 (PS1) is a substrate of GSK-3beta. PS1 is important in gamma-secretase activity. Gamma and beta secretases process amyloid precursor protein (APP) into A-beta. CUR treatment reduced the production of A-beta, PS1 and GSK-3beta. CUR was proposed to decrease A-beta production by suppressing the GSK-3beta induced activation of PS1 (Xiong et al., 2011). CUR can activate the WNT/beta-catenin pathway by suppressing GSK-3beta in SH- SY5Y neuroblastoma cells. In contrast, the levels of beta-catenin and Cyclin D increased. The levels of beta-catenin were higher in the nucleus after CUR treatment (Zhang et al., 2011). adipocyte differentiation, CUR restored the nuclear translocation of beta-catenin. In contrast, CUR treatment reduced the expression of casein kinase alpha (CK1-alpha), GSK-3beta, Axin and other components of the beta-catenin destruction complex. Thus CUR suppressed the adipogenic process of 3T3-L1 cells by increasing levels of WNT targets such as: c-Myc, cyclin D1, WNT10b, FZZ and LRP5 and decreased CK1-alpha, GSK-3beta, Axin and stabilized beta- catenin. (Ahn J et al., 2010). phosphorylation in the 3T3-L1 pre-adipocyte line. During the process of model. The authors postulated that AKT/GSK-3beta may be important for mediating the effects of CUR in this diabetic cardiomyopathy model (Yu et al., 2012). CUR has been shown to suppress GSK-3 and other signaling pathways in nephrectomized rats. CUR prevented cardiac remodeling by suppression of hypertrophic signaling including GSK-3beta phosphorylation which is normally induced in nephrectomized mice. CUR may prove useful in suppressing hypertrophy in patients with chronic renal therapy (Ghosh et al., 2010). CUR was shown to protect rats in regional myocardial ischemic/reperfusion (I/R) injury. 3beta. In contrast, the phosphorylation of p38 and JNK were reduced after CUR treatment. The phosphorylation of GSK-3beta that was induced by CUR was suppressed by the PI3K inhibitor Wortmannin and the MEK inhibitor UO126. Treatment with the GSK-3 inhibitor SB216763 suppressed the infarct size and increased the levels of GSK-3beta phosphorylation which results in its inactivation (Jeong et al., 2012). These studies indicate that in some experimental systems CUR can have opposite effects on various biological processes. The PI3K/PTEN/Akt/mTORC1/GSK-3 pathway is very important in cancer (Kriplani et al., 2015; Fitzgerald et al., 2015; Baer et al., 2015; Kriplani et al., 2015; Jhanwar. 2015; Mollinedo et al., 2015; Shears SB. 2015; McCubrey JA et al., 2015, Dusaban et al., 2015; Olayanju et al., 2015; Spinelli et al., 2015; Jhanwar-Uniyal et al., 2015; Carroll et al., 2015; Schurmans et al., 2015 Jahan et al., 2015; Barker et al., 2015 CJ, Li L, Köhler & Berggrenm, 2015; Scoumanne et al., 2016; Geck & Tocker, 2016; Fields et al., 2016; Anderson et al., 2016; Maczis et al., 2016; Falasca & Ferro. 2016; Cocco et al., 2016; Tanaka et al., 2016; Perdios et al., 2016; Erneux et al., 2016; Banfic et al., 2016; Pyne et al., 2016; McCubrey et al., 2017a; McCubrey et al., 2017b). The spleen tyrosine kinase (SYK) is constitutively-activated in B- lymphomas. CUR down-regulated SYK and AKT activity. Some of the effects of CUR may be mediated by inhibition of GSK-3 phosphorylation which is normally stimulated by AKT (Gururajan et al., 2007). Combining CUR with the PI3K inhibitor LY294002 increased apoptosis in MCF-7 breast cancer cells. In these studies, increased levels of phosphorylated AKT (activated) and GSK-3 (inactivated) were detected after CUR treatment (Kizhakkayil et al., 2010). CUR can act as an anti-oxidant and synergize with other drugs. When CUR is exposed to hypoxic conditions, it becom.es a free radical which can cause apoptosis. This may affect aldehyde dehydrogenase 1 (ALDH1A1) and GSK-3 activity in drug-resistant breast cancers. (Kesharwani et al., 2015). CUR regulated the expression of miR-9 in oral squamous cell carcinoma (OSCC). The levels of miR-9 were significantly lower in clinical OSCC patient samples than in adjacent non- tumor specimens. CUR upregulated the expression of miR-9 and suppressed WNT/beta-catenin expression. The expression of GSK-3beta was increased in CUR-treated cells as was phosphorylated GSK-3beta and beta-catenin while the levels of Cyclin D1 were decreased. Suppression of miR-9 by anti-miR-9 oligonucleotides prevented the effects of CUR on growth suppression and re-activated WNT/beta-catenin signaling (Xiao et al., 2014). The curcumin derivative tetrahydrocurcumin (THC) has been determined to be more effective than curcumin in suppressing colon carcinogenesis that can be experimentally induced by azoxymethane treatment. CUR and THC have been shown to suppress WNT1, beta-catenin protein levels in colonic tissue. Thus, CUR and THC may suppress WNT1 and beta-catenin protein levels as well as phosphorylation of GSK-3beta. Thus CUR and THC may suppress the WNT3/beta-catenin/GSK-3 signaling which is important in AOM-induced colon tumorigenesis (Lai et al., 2011). One of the major therapeutic problems with administration of CUR to cancer patients is the low solubility of CUR. Lipid based nanoparticles have shown promise in increasing the effectiveness of CUR in various cancer scenarios. A recent report deals with the delivery of CUR in lipid based nanoparticles to ovarian cancer cells. (Bondi et al., 2017). Berberine can decrease blood glucose by elevating GS. GSK-3 normally phosphorylates and inactivates GS. Berberine can lower the high blood glucose in alloxan-induced diabetic mice. Decreased phosphorylated AKT was detected in diabetic mice but berberine inhibited this from occurring. Berberine also inhibited the increase in GSK-3beta phosphorylation which would decrease GSK-3beta activity and increase GS activity. berberine lead to lowering the high glucose in the alloxan-induced diabetic mice (Xie et al., 2011). Berberine reduced GSK-3beta activation of streptozotocin-induced type-II diabetic rats. This resulted in improved cardiac function which is normally a major cause of death and type-II diabetics. berberine treatment of diabetic rats increased 5’adenosine monophosphate-activated protein kinase (AMPK) localized in the heart as well as AKT activation and decreased the levels of GSK-3beta. The AMPK inhibitor compound C was determined to block the effects of berberine (Chang et al., 2015). A diagram of the effects of berberine on various diseases is presented in Figure 2. 8. Effects of berberine on PI3K/PTEN/Akt/mTORC1/GSK-3 Pathway in Neurology berberine isolated from Coptis chinensis Franch, has been shown to improve cognitive ability in an AD transgenic mouse model (TgCRND8). berberine improved beta-amyloid pathology and gliosis. berberine treatment reduced the level of both detergent-soluble and -insoluble beta-amyloid in mouse brain homogenates. GSK-3beta is a major kinase involved in amyloid precursor protein (APP) and tau phosphorylation. berberine inhibited GSK-3. This resulted in decreased levels of C- terminal APP fragments and phosphorylation of APP and tau. Thus berberine may negatively regulate GSK-3 and APP processing which are important in AD (Durairajan et al., 2012). Berberine treatment has been shown to result in increased phosphorylation of AKT (activation) and GSK-3beta (inactivation) in the ischemic cerebral cortex of rat brains after permanent middle cerebral artery occlusion (pMCAO). berberine treatment decreased neurological memory problems, brain water content and infarct sizes. berberine treatment increased the expression of phosphorylated AKT, GSK-3beta, CREB and claudin-5 and decreased the levels of NF- kappaB (Zhang et al., 2012). In a model with hippocampal specimens isolated form 6-8 day old male rats, berberine was shown to evoke neuroprotection to oxygen and glucose deprivation (OGD). Western blot protein analysis suggested roles for AKT, GSK-3beta, ERK and JNK in berberine-mediated neuroprotection after ischemia. AKT and ERK1/2 were postulated to be involved in protective survival while JNK, Caspase-3 and GSK-3beta were inhibited (Simões Pires et al., 2014). GSK-3beta is involved in WNT signaling in neurons. berberine may regulate lipoprotein receptor expression in cerebellar granule neurons (CGN). berberine increased very-low-density lipoprotein receptor (VLDLR) expression in CGN. VLDLR upregulation is associated with stabilization of hypoxia-induced factor-1 alpha (HIF-1alpha) and suppressed beta-catenin levels which inhibited WNT signaling. This occurs via GSK-3beta phosphorylation (Kysenius et al., 2016). berberine can have effects on the WNT/beta-catenin pathways by promoting sodium nitoroprusside-mediated proliferation of rat chondrocytes in a rat osteoarthritic (OA) model. In this model, berberine treatment increased the percentage of cells in S-phase and decreased the percentage of cells in G0/G1 phase. This resulted in the proliferation of sodium nitroprusside- stimulated rat chondrocytes. In this model, berberine treatment increased beta-catenin, c-MYC and Cyclin D1 but down regulated GSK-3beta and MMP-7 expression (Zhou et al., 2016). Combining berberine with the dual EGFR/HER2 inhibitor lapatinib can suppress lapatinib- resistance of HER2+ breast cancer. This was shown to occur by increasing the levels of ROS. Lapatinib activates the c-MYC/pro-NRF2 and GSK-3beta signaling pathways. This results in stabilization of NRF2 and a low level of ROS in lapatinib-resistant cells. BBB increased ROS production by decreasing c-MYC expression and lapatinib-resistance was decreased (Zhang et al., 2016). Berberine has been shown to inhibit the effects of the alpha melanocyte stimulating hormone (alpha MSH) on melanoma cells. berberine prevented the induction microphtalia-associated transcription factor (MITF) and tyrosinase normally mediated by alpha MSH treatment. berberine prevented the phosphorylation of PI3K, AKT and GSK-3beta and ERK1,2 which are normally stimulated by alpha-MSH treatment. berberine inhibited melanin synthesis and tyrosinase activity. berberine may be useful in the treatment of certain skin pigmentation disorders (Song et al., 2015). 10. Effects of RES on PI3K/PTEN/Akt/mTORC1/GSK-3 Pathway in Aging The effects of RES on Sirtuin-1 (SIRT1) activity were examined on rat somatotrophs anterior pituitary cells in vivo and in vitro. SIRT1 activation by RES suppressed GSK-3beta acetylation on K205. This leads to GKS3 activation, which is an important step in Sirt1 induced CREB inhibition. CREB inhibition compromises growth hormone (GH) synthesis. Inhibition of GH synthesis increases lifespan and improves metabolic profile in obese humans. Thus, RES might reduce aging-related pathologies in part by regulating GH level through Sirt1 and GSK3 pathway (Monteserin-Garcia et al., 2013). A diagram of the effects of RES is presented in Figure 3. RES has been shown to inhibit the inflammation induced by heat-killed Listeria monocytogenes (HKLM). HKLM stimulated phosphorylation of ERK1,2 and GSK-3. The GSK- 3 inhibitor potentiated and The MEK inhibitor suppressed the inflammatory effects of HKLM. Treatment with RES blocked phosphorylation of the two kinases. These authors have proposed that the anti-inflammatory effects of RES may be mediated in part by ERK1,2 and GSK-3 (Park et al., 2012). The neuroprotective effects of RES have been examined in an in vitro model of ischemia which employed oxygen-glucose deprivation of hippocampal samples. RES was shown to induce the phosphorylation of AKT, GSK-3 and ERK1,2. The neuroprotective effects of RES were suppressed by PI3K but not MEK inhibitors (Zamin et al., 2006). RES will activate AMPK to stimulate insulin signaling and glucose uptake in skeletal muscle cells. RES treatment of Neuro-2a (N2A) cells resulted in AKT and GSK-3beta phosphorylation. AMPK was activated after RES treatment which could be inhibited by treatment with the AMPK inhibitor compound C. Compound C also abolished AKT and GSK- 3beta phosphorylation, glucose uptake and insulin signaling (Patel et al., 2011). RES protects against cerebral ischemia by its anti-oxidant and oxygen free radicals scavenging properties. In the four-vessel occlusion model of global cerebral ischemia, GSK- 3beta and CREB are believed to play roles in RES-evoked neuroprotection (Simão et al., 2012). The effects of delivery of RES in lipid core nanocapsules has been determined to improve neuroprotective roles after A-beta administration to rats. The use of lipid core nanoparticles might be a more effective means to deliver RES and alter JNK and GSK-3 signaling pathways altered in AD due to A-beta peptide (Frozza et al., 2013). RES treatment can result in GSK-3beta phosphorylation. Dietary supplementation of RES resulted in increased levels of phosphorylation GSK-3beta and protein levels of debrin and transthyretin, two important proteins involved in protection against neurogenerative diseases (Varamini et al., 2013). RES has neuroprotective effects on astrocytes after traumatic brain injury. This was shown to occur by inhibiting both apoptotic and autophagic cell death. In a traumatic brain injury model, both apoptotic and autophagic cell death were induced in CTX TNA2 astrocytes by glutamate-mediated GSK-3beta activation. Suppression of GSK-3beta activity resulted in increased survival, while overexpression of GSK-3beta increase glutamate-mediated excitotoxicity. RES suppressed ROS-mediated GSK-3beta activation. The ROS/GSK-3beta pathway was also determined to induce various damage processes associated with the mitochondria (Lin et al., 2014). RES has been determined to induce its neuroprotective effects against brain ischemia reperfusion in rats by decreasing the DJ-1 protein and activating the PI3K/AKT which suppressed GSK-3beta activity (Abdel-Aleem et al., 2016). Treatment of diabetic rats with RES regulated the levels of lactadherin. Lactadherin is detected at higher levels in the aorta of diabetic rats. Lactadherin may play a role in advanced glycation end products (AGE)-induced apoptosis which may be important in endothelial cell (EC) dysfunction and the development of diabetes. Overexpression of lactadherin reduced GSK- 3beta phosphorylation. RES protected against AGE-mediated EC apoptosis by targeting lactadherin (Li et al., 2011). RES protected slow-twitch muscle in streptozotocin-induced diabetic rats. Phosphorylation of AKT and GSK-3beta were decreased in the diabetic rats in both their fast- and slow twitch muscles (Chang et al., 2014). In a porcine model of metabolic syndrome, REV supplementation led to improved glucose control. REV significantly elevated the expression of several proteins regulating glucose metabolism in skeletal muscles and liver, among them phospho-AKT (residue T308), GLUT-4, peroxisome proliferating activation receptor γ coactivator 1α (PGC-1α) and insulin receptor substrate 1. phospho-AKT inhibits GSK-3 thus enhances GS and reduces hyperglycemia. Therefore, RES prevents insulin resistance induced by a high-calorie, high-fat diet in part acting through GSK-3 (Burgess et al., 2011). 14. Effects of RES on chronic skeletal muscle impairment. In C2C12 cells, REV stimulated AKT and ERK1,2 activation and AMPK protein levels. These proteins, by activating downstream signaling pathways, have positive effect on myoblasts differentiation and muscle hypertrophy. These authors conclude that REV might be used in treatment of chronic functional and morphological muscle impairment (Montesano et al., 2013). AKT promoted skeletal myotubes hypertrophy in part by inhibiting GSK-3 (Rommel et al., 2001). Thus, some of the effects of REV on muscle hypertrophy might be mediated by regulation of GSK-3 activity. 15. Effects of RES on PI3K/PTEN/Akt/mTORC1/GSK-3 Pathway in Cardiovascular Disorders. Isorhapontigenin (ISO) is a RES analog. ISO blocks oxidative stress and associated signaling pathways in cardiomyocytes. This inhibits cardiac hypertrophy. ISO was determined to suppress the effects of protein kinase C (PKC) on the PI3K/PTEN/AKT/GSK-3 pathway. ISO was shown to suppress the development of cardiac hypertrophy via various signaling pathways (Li et al., 2005). RES has been determined to reduce cardiac mitochondrial swelling and infarct size at reperfusion. This can result in cardiac protection. RES was determined to enhance GSK-3beta inhibitory phosphorylation. RES may target the mitochondrial permeability transition pore (mPTP) by inducing the translocation of GSK-3 from cytosol to mitochondrial which allows GSK-3beta to interact with cyclophilin D to regulate mPTP (Xi et al., 2009). GSK-3 inhibition has been shown to stimulate muscle fructose-1,6-bisphosphatase (FBP2) interaction with cardiac mitochondria. FBP2 protects mitochondria against swelling interacting with proteins involved in formation of mPTP. Thus, this might be another part of the mechanism of RES-induced reduction cardiac mitochondria swelling (Gizak et al., 2012). Five micromolar RES treatment can activate the Raf/MEK/ERK and PI3K/PTEN/AKT/mTORC1 pathways which will result in phosphorylation of GSK-3beta in human umbilical vein endothelial cells (HUVEC) cells. RES at concentrations between one to ten micromolar increased the expression of VEGF and stimulated angiogenesis. In contrast, at high RES concentrations, twenty mircomolar and higher, it had the reverse effects. The increase in VEGF expression was dependent on nuclear accumulation of beta-catenin (Wang et al., 2010). The effects of 3,5,4′-trimethoxystilbene (MR-3), a methoxylated derivative of RES, has been examined in MCF-7 breast cancer cells. MR-3 treatment increased E-cadherin expression, while decreasing SNAIL, SLUG and vimentin expression. This treatment also resulted in decreased invasion and migration. These effects were linked with decreased expression and nuclear translocation of beta-catenin, as well as, decreased transcription of beta-catenin target genes. MR-3 treatment also restored GSK-3beta activity and suppressed AKT phosphorylation. Thus, EMT and invasion were blocked in MR-3-treated MCF-7 cells (Tsai et al., 2013). Ten micromolar RES can affect the PI3K pathway in an estrogen-receptor (ER)-alpha dependent fashion in breast cancer cells. In contrast, fifty micromolar RES treatment resulted in decreased activity. The anti-estrogen ICI 182,780 blocked the ER-alpha dependent effects. RES induced the proteasomal degradation of ER-alpha. Thus, RES could suppress survival and proliferation of ER+ breast cancer cells by regulating ER-alpha-associated PI3K/PEN/AKT/mTORC/GSK-3beta pathway (Pozo-Guisado et al., 2004). RES has been shown to stimulate endoplasmic reticulim (ER) stress mediated apoptosis by interfering with glycosylation. RES inhibited the hexosamine biosynthetic pathways and activated GSK-3beta. This resulted in interrupted protein glycosylation. Inhibitors of GSK-3 suppressed the effects of RES on protein glycosylation (Gwak et al., 2016). The effects of RES on apoptosis regulated by beta-arrestin-2 have been shown to be dependent on the PI3K/PTEN/AKT/mTORC1/GSK-3 pathway in endometrial cancer (EC). Transfection with beta-arrestin and treatment with RES resulted in reduced levels of phosphorylated AKT and GSK-3beta (Sun et al., 2010). Suppression of GSK-3beta by siRNA knockdown increased the levels of ferritin H mRNA induction by RES. Suppression of AMPK-alpha by compound C or siRNA knockdown suppressed the protective effects of RES in CD3+ T cells exposed to oxidative stress. AMPK- alpha was shown to play a role in the expression of the ferritin H gene which is induced by RES via an anti-oxidant responsive element present in the promotor regions of certain genes (Iwasaki et al., 2013). RES will suppress the development of experimental N-nitrosbis (2-oxopropyl)amine pancreatic cancers in hamsters. RES treatment decreased PI3K/PTEN/AKT/mTORC1/GSK- 3beta and RAF/MEK/ERK signaling. Decreased levels of phosphorylated GSK-3beta at S9 and ERK1,2 were detected in the nucleus (Kato et al., 2015). The relationship between RES and VEGF-B was examined in pancreatic cancer cells. RES was determined to suppress growth and induce apoptosis in Capan-2 pancreatic cancer cells. RES induced BAX and VEGFR-B expression. siRNA specific for VEGF-B increased the apoptotic rate and suppressed GSK-3beta but did not affect BAX. Thus, RES exerted two disparate effects, it increased the anti-cancer BAX levels and it increased the pro-cancer VEGFR-B levels. The authors proposed that the anti-cancer effects of RER were stronger than the pro-cancer effects (Yang et al., 2014). GSK-3beta will phosphorylate cyclin D1 at T286 which results in its targeting for ubiquitination and proteasomal degradation. Knock down of quinone reductase 2 (NQO2) in CWR22Rv-1 prostate cancer cells resulted in slower proliferation and decreased phosphorylation of RB and Cyclin D1. Increased AKT and decreased GSK-3beta activity and cyclin D1 phosphorylation were observed in the cells after NQO2 knockdown. Knockdown of NQO2 prevented the ability of RES to downregulated Cyclin D1. These results suggest that RES may exert inhibitory effects on prostate cancer cells by NQO2, GSK3-beta and Cyclin D1 (Hsieh et al., 2012). RES has also been shown to down regulate Cyclin D1 in ovarian cancer cells by affecting AKT and GSK-3beta phosphorylation. RES also reduced the levels of ERK1,2 phosphorylation. PI3K and MEK inhibitors increased the effects of RES (Vergara et al., 2012). RES can protect mitochondria against ROS-induced oxidative stress. This occurred by inhibition of GSK-3beta. RES can exert many of its effects by modulating the activities of SIRT1, LKB1 and AMPK. RES treatment suppressed the apoptosis, glutathione depletion and ROS production that are normally induced by arachidonic acid (AA) and iron in HEPG2 liver cells. RES increased phosphorylation of GSK-3beta which lies downstream of AMPK. Suppression of LKB1 with a siRNA resulted in inhibition of AMPK and prevented the ability of RES to protect the HEPG2 cells from mitochondrial dysfunction. These studies indicate a role of RES in the activation of AMPK and inhibition of GSK-3beta. This results in protection of liver cancer cells from AA- and iron-induced ROS production and mitochondrial dysfunction (Shin et al., 2009). The synthetic RES aliphatic derivative (R6A) has been shown to inhibit Toll-mediated apoptosis in HEK 293 cells. R6A inhibited Toll like receptor-2 (TLR2) expression. Overexpression of TLR2 resulted in a decrease in apoptosis after treatment with R6A. The effects of R6A on TLR2 expression were determined to involve the AKT/GSK-3beta signaling axis (Chen et al., 2009). RES has been shown to induce apoptosis in the MOLT-4 T lymphoblastic leukemia cell line. RES inhibited the NOTCH signaling pathway. RES also inhibited the PI3K/PTEN/AKT pathway which resulted in GSK-3beta activation. RES was shown to induce apoptosis in MOLT- 4 cells by suppressing the NOTCH signaling pathway which has interactions with GSK-3 (Cecchinato et al., 2007). RES has been shown to regulate the activity of the androgen and estrogen receptors in prostate cancer cells. RES was shown to inhibit PI3K activity in LNCaP and PC3 prostate cancer cells. RES treatment resulted in decreased GSK-3 phosphorylation which resulted in its activation and phosphorylation of Cyclin D1. Thus, RES was inducing GSK-3 activity which was suppressing Cyclin D1 (Benitez et al., 2007). 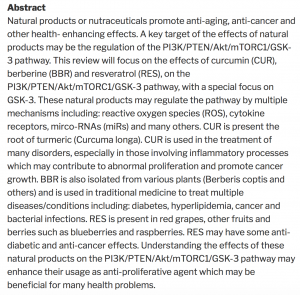 Natural products/nutraceuticals such as CUR, BER and RES may serve to regulate GSK- 3 activity which can often have suppressive effects on various diverse biochemical processes. Understanding the effects of these natural compounds on various signaling pathways implicated in different diseases may enhance their usefulness as dietary supplements and drugs.